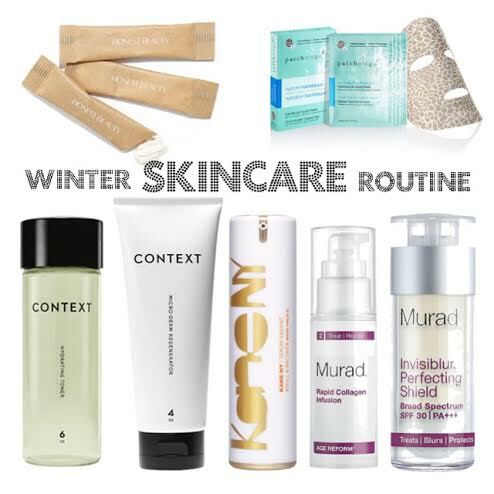 With these fabulously low winter temperatures, our skin unfortunately often tends to suffer. I try to switch up my skincare routine every season, and the products listed below are my daily go-to’s that I’ve been using for the past month or so. These products aren’t all specifically targeted towards winter, but they all work well to target dry, dull winter skin (and more!). As always, even if one or more of these products don’t suit your personal needs, find what works best for you and always invest in a solid skincare routine! .:. 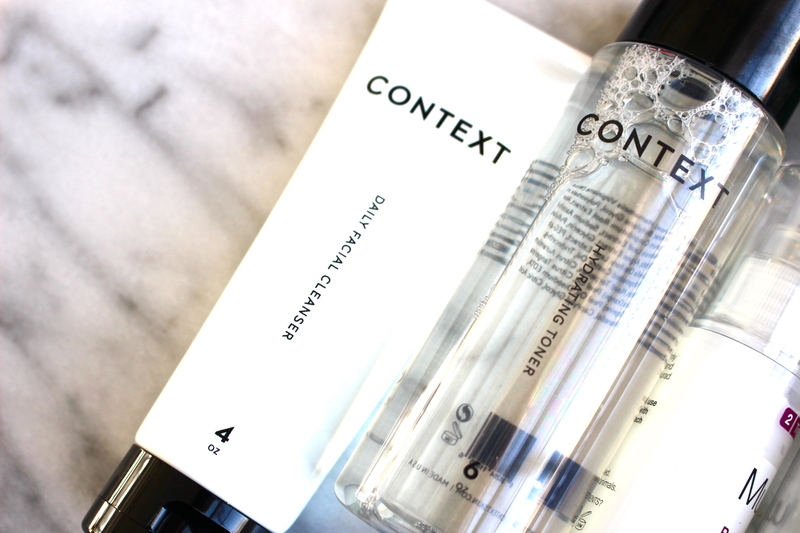 Context Skin – Daily Facial Cleanser & Hydrating Toner .:. This is one of my favorite skincare companies of all time. It’s a unisex skincare line created by David Arbuthnot who has made a huge impact in the fashion and beauty industries (Gucci, Dior, DKNY to name a few). Context packs all of their products with the safest, nutrient rich ingredients and is paraben, sulfate, pthalate and fragrance free which is really important. I use their Daily Facial Cleanser both morning and night. It has the consistency of a thick lotion and goes on really smooth and doesn’t foam up when massaged into skin. It’s great for any skin type, contains tons of vitamins, natural oils and antioxidants, doesn’t strip your skin of its natural oils and just leaves you with a really clean, refreshed end result. I follow up with their Hydrating Toner. It has a strong citrus scent, refreshes, brightens and tackles anything that wasn’t picked up from the cleanser alone. It’s loaded with vitamin C, witch hazel, algae, green tea and Japanese knotweed extract. This is the ultimate skin food that properly refreshes and preps your skin for any serums and moisturizers that follow. .:. 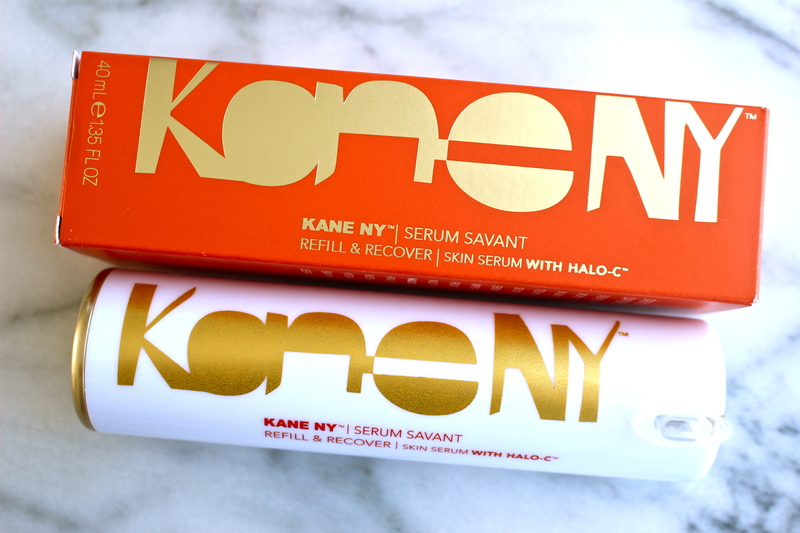 Kane NY – Serum Savant .:. Created by an elite NYC plastic surgeon who is a global expert in injectables. To be honest – I am not into the plastic surgery thing AT ALL. Needles, cuts, injections… not for me! However this serum approaches skin like a plastic surgeon (minus the pain) and aims to target fine lines and wrinkles, while lifting, firming and moisturizing skin while leaving a light radiance. It’s a hyaluronic acid based anti-aging serum that brightens, tightens and protects. 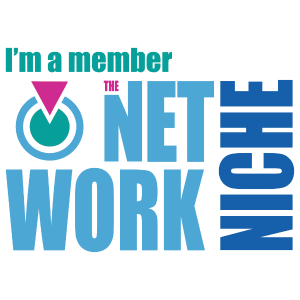 This is totally a splurge, but if you’re looking for professional results, fast.. it’s worth it. I use this after using my cleanser & toner every night for it to work its wonders over night while I sleep! .:. Patchology .:. 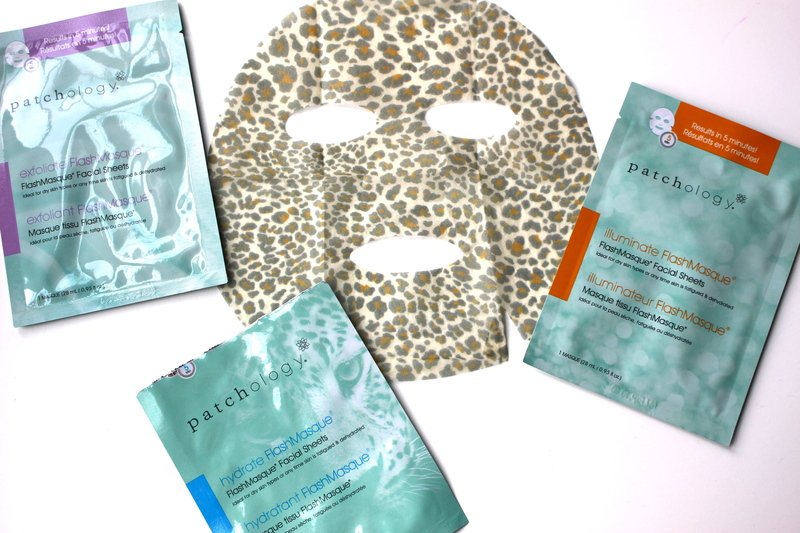 My favorite sheet masks of all time.. the Patchology FlashMasques. They are THE best you will ever find. Exfoliate removes dead skin cells, Hydrate packs a ton of moisture for smooth, soft skin and Illuminate reveals a fresh-faced radiance, all in just 5 minutes! I treated myself to a little “spa time” and used the Hydrate face mask for 50 minutes (yes 50! ), my skin felt the best it ever has, SO soft and smooth, refreshed and insanely hydrated. I also use their FlashPatch Eye Gels daily for revived, awake eyes. They contain 2 essential ingredients, caffeine and hydrolyzed collagen, for smoother, less puffy under eyes with immediate results. Some days sleep is the last thing on my mind and more often than not I get less than I’d like. Luckily, with these eye gels, you can’t even tell that I’m functioning off of 4-5 hours of sleep many days. The advanced cooling and hydrogel make you feel like you’re at an upscale spa and make for even, smooth skin, ideal before applying makeup. I also love their newest product, the FlashPatch Lip Gels. A powerful combination of Peptides, Green Tea Extract and Niacinamide, they provide deep hydration and revitalization AND you guessed it – in only 5 minutes! 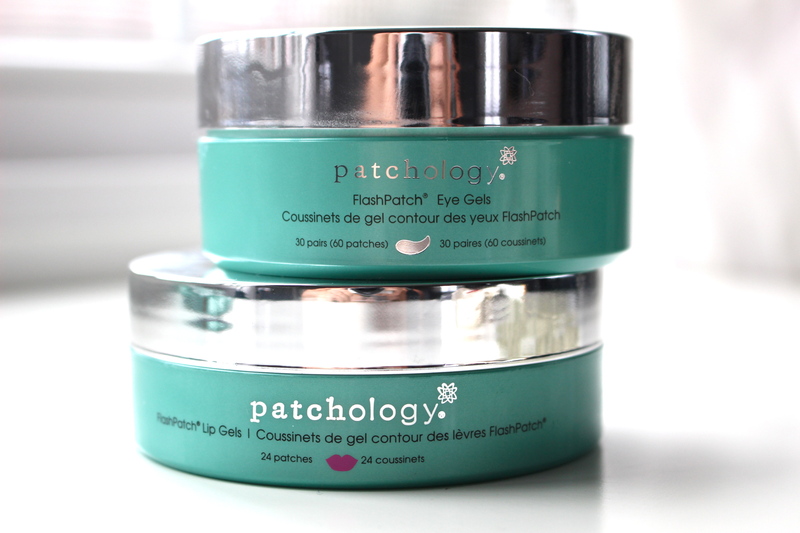 I cannot say enough about Patchology and their game-changing product line, I will forever be a fan. 100% recommend. .:. Honest Beauty – Powder Cleanser .:. If you’re looking for a light, gentle foaming cleanser.. this is for you. It gently cleans away excess oil without stripping your skin. It’s a combination of calendula, chamomile, aloe, aspen bark, oat & rice powder. The unique combination targets to soothe and calm skin, exfoliate and absorb excess oil. Coming from someone with super oily skin (T-zone) this is much appreciated. I love that each amount is already pre-packed and measured out for you, making this ideal for traveling. 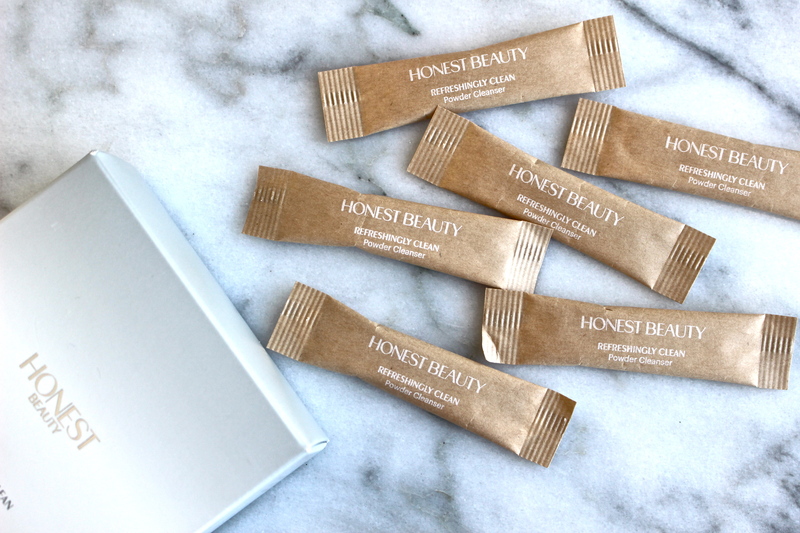 Like all of the Honest Company’s products, it’s made without talc, parabens, formaldehyde carriers, PEGs, PPGs, propylene glycol, silicones, synthetic fragrances, or dyes. And is something you can feel safe about using on your skin. .:. 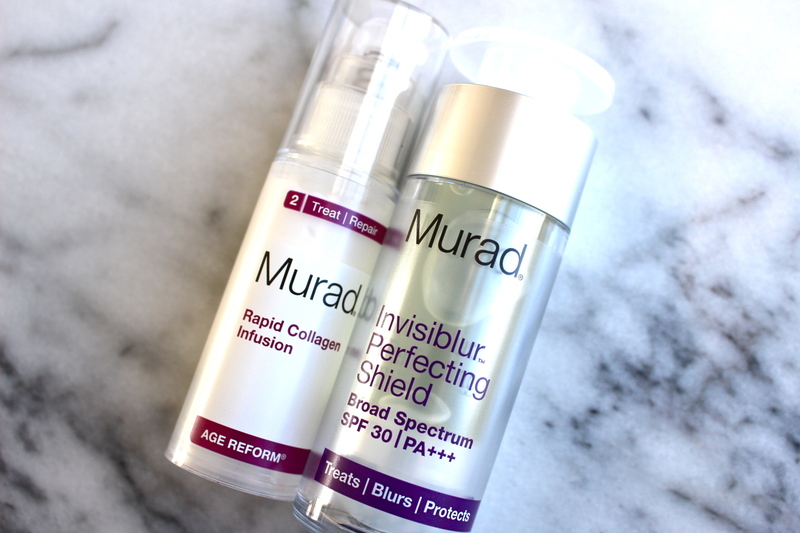 Murad – Rapid Collagen Infusion & Invisiblur Perfecting Shield .:. I’m 27 so I can’t really complain about wrinkles or fine lines just yet.. luckily! BUT – a little boost of collagen anyway is totally welcome over here! Even if you’re goal isn’t to fight wrinkles the Murad Rapid Collagen Infusion improves skin’s smoothness and radiance overall. It contains a powerful combination of winged kelp, fatty acids and hyaluronic acids targeted to protect skin from sun damange, sooth irritation and plump skin. I love adding this step to my morning routine. The Invisiblur Perfecting Shield is my final skincare step each morning before I apply any makeup. It’s designed to improve skins tone and texture while protecting it with invisible SPF 30. Of course, protecting your skin from the sun is 100% necessary and a good primer is too! I can’t apply foundation without a quality primer, the results speak for themselves. For me, this has helped vanish and control any excess oil. My foundation glides on and my skin looks and feels smooth.